We weren’t able to make it to the recent CD release party for Eddy “The Chief” Clearwater‘s new album Soul Funky at Buddy Guy’s Legends, nor have we yet had the chance to check out the video from the show on gigity.tv but we have to imagine the night was much like the album itself: a live, rollicking good time that nicely captures the still-impressive energy and abilities of the 79-year-old guitarist and singer, joined by such friends as fellow Chicago guitar slinger Ronnie Baker Brooks, harmonica player Billy Branch, and keyboardist Johnny Iguana (with Big Head Todd & the Monsters’ Todd Park Mohr also making an appearance at the CD release party). 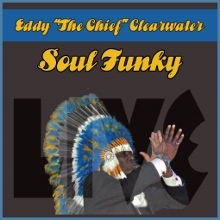 Recorded this past January at Evanston, Illinois’ SPACE, Soul Funky (on Clearwater’s own Cleartone Music label) is the first live album for Clearwater since his 1990 A Real Good Time, which, if it weren’t already taken, would also have been a pretty appropriate title for this remarkably entertaining and diverse set from the cousin of the late Chicago harmonica player Carey Bell. It all kicks off with a funky, pulsing “They Call Me The Chief” – one of the most rocking intros you may ever hear – penned by Ronnie Baker Brooks, who not only produced the West Side Strut album on which the song originally appeared but also joins Clearwater as a special guest on this set, adding some terrific licks throughout. That includes, for example, on a few other West Side Strut tracks that follow in an again-funky “Hypnotized” and the swinging, Chuck Berry-style number “Too Old to Get Married” (also written by Baker Brooks), on which Clearwater proves to still be plenty capable of rocking out, with a punchline to the chorus of “too young to be buried” and other lyrics that include “some people might say that I’m too old, I saw the blues convert to rock & roll” and “I’ve gotta’ get my groove on and party all night”. “Good Times are Coming” is a nice mid-tempo rocker that finds the band sounding great, including some sweet piano from Johnny Iguana and harmonica from Shoji Naito (who also plays guitar and bass for the band), followed by a 13-minute medley that starts on Clearwater’s creeping “Came Up the Hard Way” featuring some particularly passionate vocals from The Chief, then picks up the pace a bit with Baker Brooks testifying both on guitar and vocals on his own “Root to the Fruit” before returning to “Hard Way”. From there, the band moves to the slick Chicago shuffle of “Cool Blues Walk”, including some impressive organ playing from Iguana, with a few other superb uptempo tunes still to come in the romping “Find You a Job” (off Clearwater’s 1980 breakthrough The Chief) and the breezy “A Good Leavin’ Alone” that sees “Chicago’s finest” Billy Branch joining on harmonica just as he did for the song’s earlier recording on West Side Strut. That’s balanced with a slow, country interpretation of B.B. King’s “Please Accept My Love” and groove-filled, Magic Sam-style creeper in “Lonesome Town”, while the largely instrumental title track (the only lyrics of which are a repeating of the song’s title) easily lives up to its name. Although born in Mississippi, Clearwater has spent most of his life in Chicago (having migrated there at 15 years old), a fact particularly evident on songs like “A Good Leavin’ Alone”, “Find You a Job”, and “Cool Blues Walk”. Clearwater’s vocals remain remarkably strong and diverse for his 79 years, ranging from a deep, throaty delivery on songs such as “Please Accept My Love” and “Lonesome Town” to the Muddy Waters-like, in-your-face bravado of “A Good Leavin’ Alone” and smooth sprightliness of tunes such as “Too Old to Get Married” and “Soul Funky”, reminding us that no list of living Chicago blues masters is complete without Clearwater’s name on it. This entry was posted in Albums and tagged Billy Branch, Eddy "The Chief" Clearwater, Johnny Iguana, Ronnie Baker Brooks, Todd Park Mohr. Bookmark the permalink.